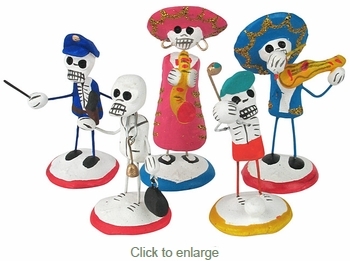 These assorted clay skeleton figures are perfect accents for your Day of the Dead celebration. In Dia de los Muertos tradition, the dead enjoy the same activities as when they were alive during this holiday. Our assortment of skeleton figures depict such activities as doctor, policeman, mariachi, golfer, and many more. All of our clay skeleton figurines are handcrafted by folk artists in Mexico. Assorted:We cannot guarantee which activity you will receive.